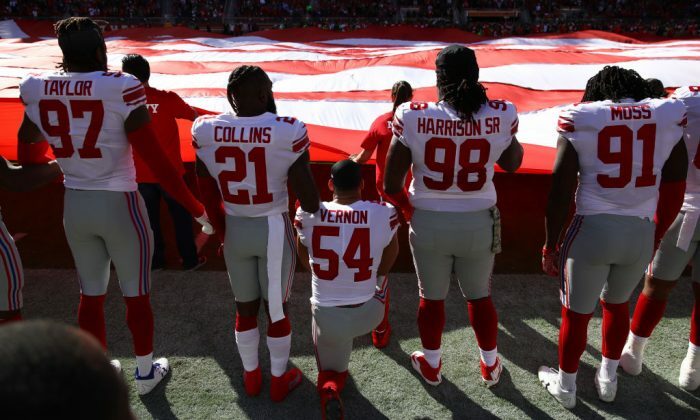 The New York Giants’ Olivier Vernon took a knee for the U.S. national anthem on Thursday night in a game against the Washington Redskins. Vernon, a defensive end, has consistently not stood for the anthem before games. He was shown on NBC cameras on Thanksgiving night doing a silent protest. Earlier this season, he attempted to explain his reasoning for the protest. President Donald Trump has been the most vocal opponent of the protests, saying that they have turned off fans. He’s referring to a new report from The Washington Post, citing unnamed sources, that said league executives are considering doing away with having players and coaches stand out on the field during the anthem. That was implemented in 2009. Earlier in the week, Trump slammed Oakland Raiders player Marshawn Lynch for sitting for the national anthem while standing for the Mexican national anthem during a game in Mexico City against the New England Patriots. A few other players around the league have persisted in protesting, but free agent quarterback Colin Kaepernick is credited with starting the movement, saying it’s to raise awareness about police brutality. We have a small favor to ask of you. More people are reading NTD than ever, but ad revenues are plummeting across media websites. If you can, please share this article on Facebook so you can help NTD. It takes less than a minute. Thank you very much!